The Egyptian Exchange (EGX) is likely to carry on the downward trend on Wednesday. 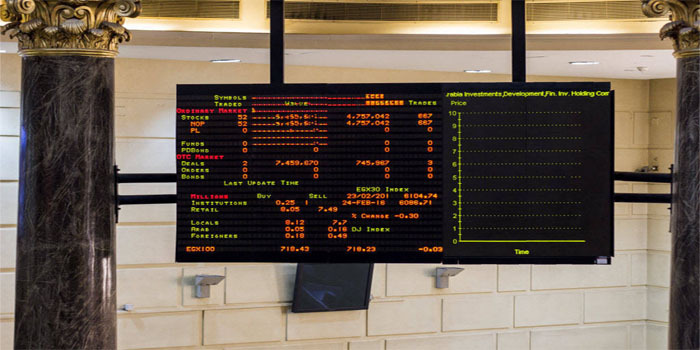 The indices of the EGX are expected to continue seeing selling pressures today until the emergence of purchasing powers that push the indices up, the head of the capital market committee at the African Economic Council told Mubasher. The benchmark EGX30 index has resistance at 14,750 and 14,930 points and has support at 14,480 and 14,300 points, Ayman Fouda said. He also indicated that the small- and mid-cap EGX70 index has a short-term resistance at 688 and 695 points and has support at 677 and 669 points. For his part, Osama Naguib, head of technical analysis at Arab Finance Securities, said that the EGX may retest main support level and hover around 14,600 points. By breaking the benchmark below 14,600 points, the index would deepen losses in the coming trading sessions and targets 14,350, 14,150, and 14,120 points, Naguib added.